When you are done here, please take a moment to check out everyone's creative pumpkin projects, decorating ideas, and recipes throughout the week. The links for the week to everyone's blogs appear at the end of this post. 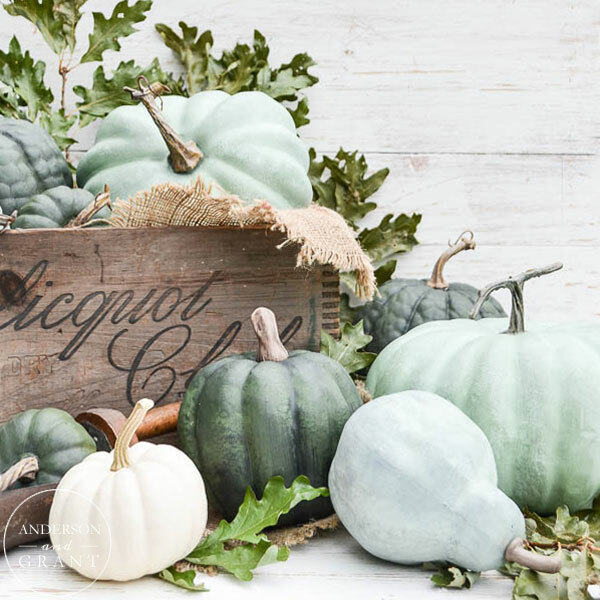 In keeping with my neutral theme for fall, I wanted to make some pumpkins in different shades of green. 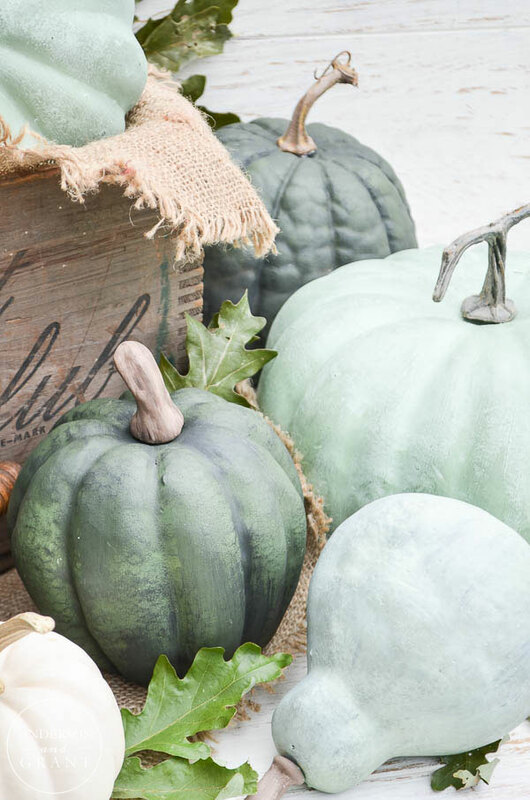 I love the texture of chalk paint, but just painting them looked so plain. So, I took the painting process one step further and dry brushed an accent color over the top. 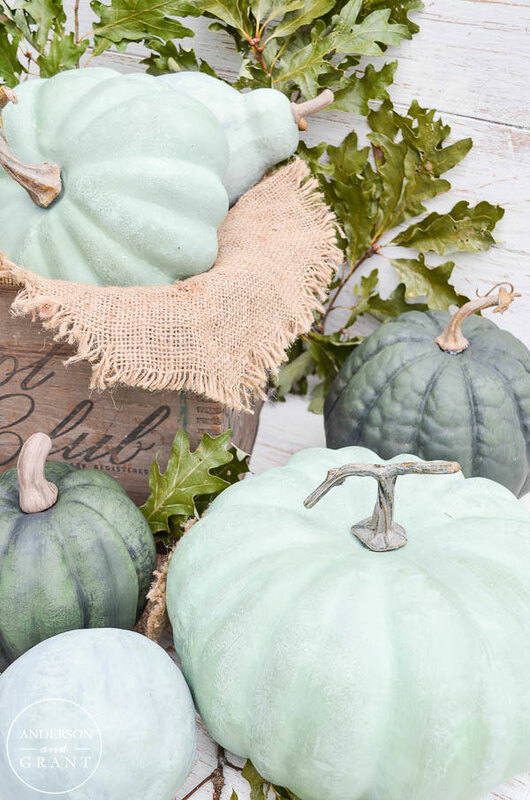 I love how this simple step takes plastic pumpkins from looking like they've been painted to actually having the texture and color variations of a real pumpkin. Interested in trying this craft for yourself? Read on to learn how! 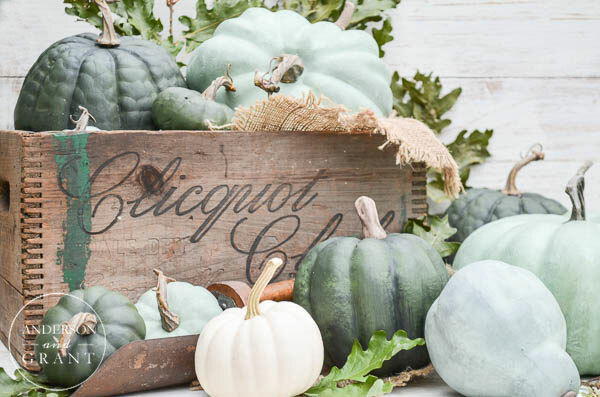 I started with random, unmatched pumpkins picked up last fall on clearance from Hobby Lobby. They were incredibly bright and not at all what I was looking for this year, but I knew that could be easily changed. 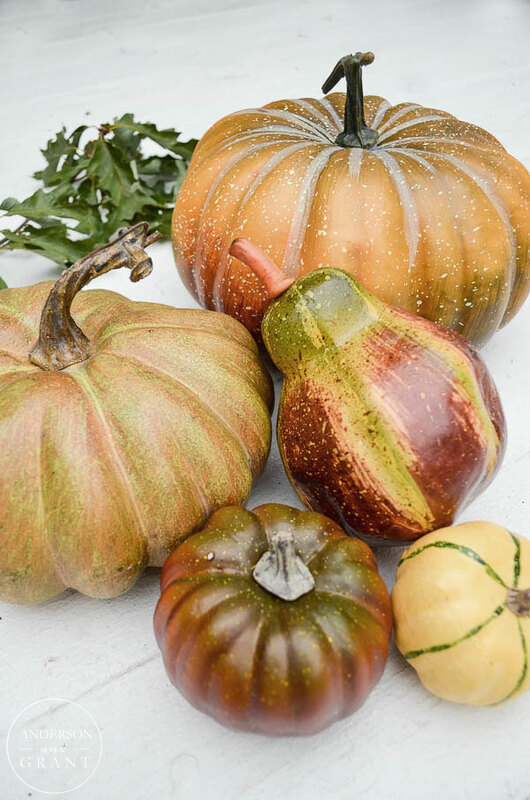 Because colors like orange and red tend to bleed and are hard to cover with a light colored paint, I started this project by basecoating all the pumpkins with Fusion Color Blocker. 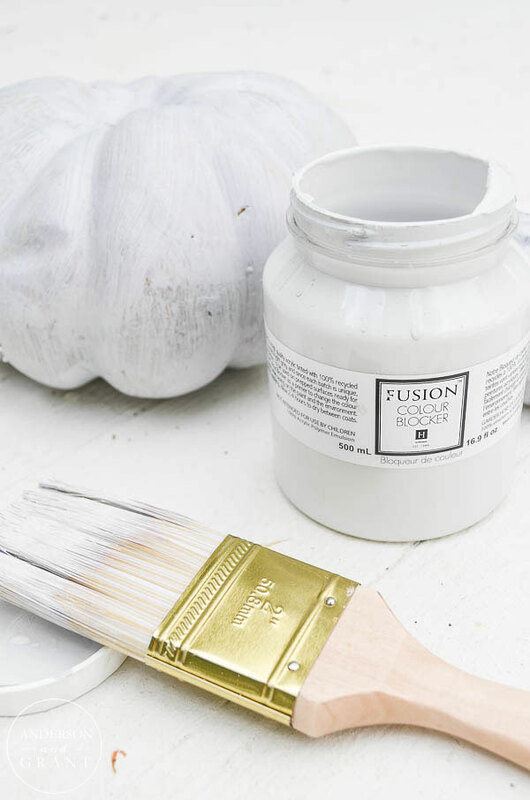 It is a light gray colored primer that helps keep the color underneath from showing through and allows you to use less of the chalk paint on top. 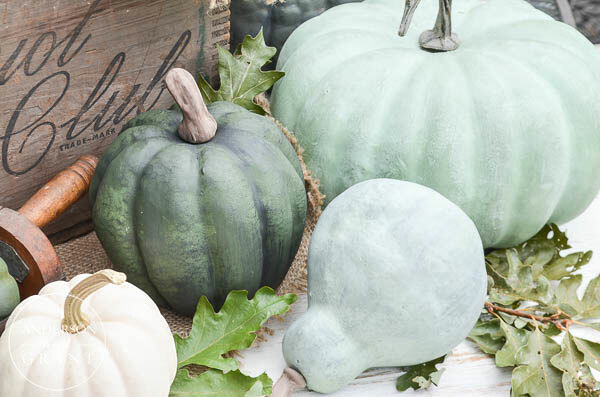 After two coats of color blocker, I painted my pumpkins with two coats of chalk paint in either a light mint color or a darker green color. 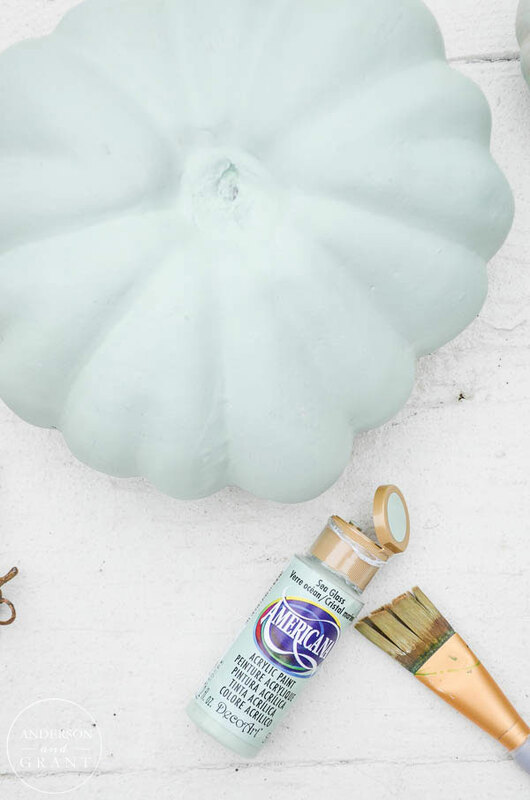 I used my recipe for chalk paint and added it to bottles of Folk Art brand craft paint, sea glass and avocado. Then comes the fun part.....Dry brushing the pumpkins to give them a bit more character! 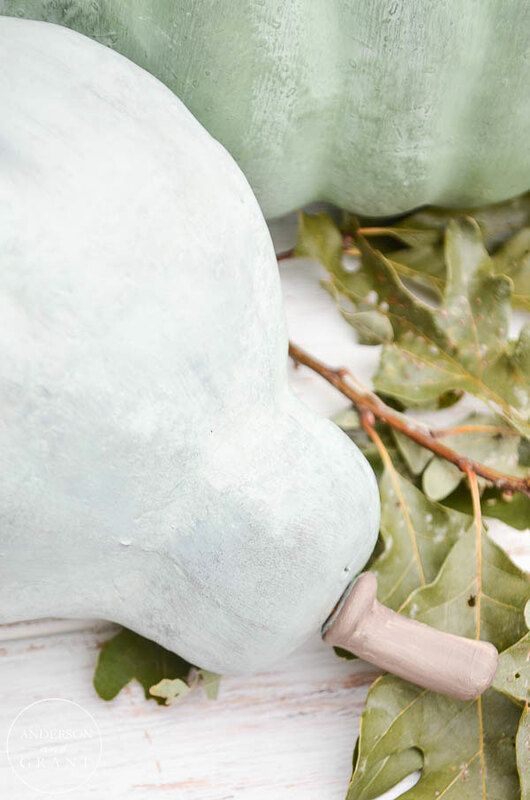 You'll want to use a craft brush that can be thrown away for this process, because it will take a bit of abuse with all the rubbing and brushing. For the mint colored pumpkins, I used avocado to dry brush on top. For some, like the small gourds in the picture I also added a bit of gray when I was brushing to change the color a little. The dark avocado pumpkins were shaded with black. To dry brush a color on top of your base, put some paint on your brush and then brush most of it off onto a piece of paper towel. 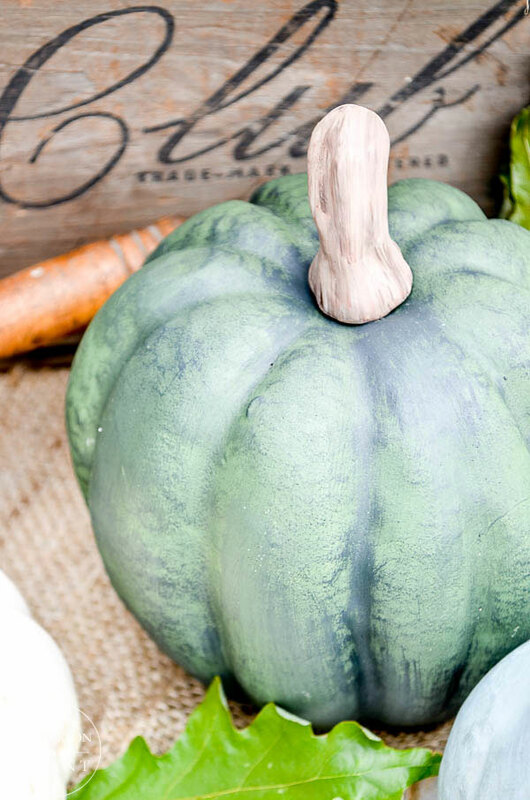 Brush the remaining paint onto your pumpkin quickly and haphazardly. 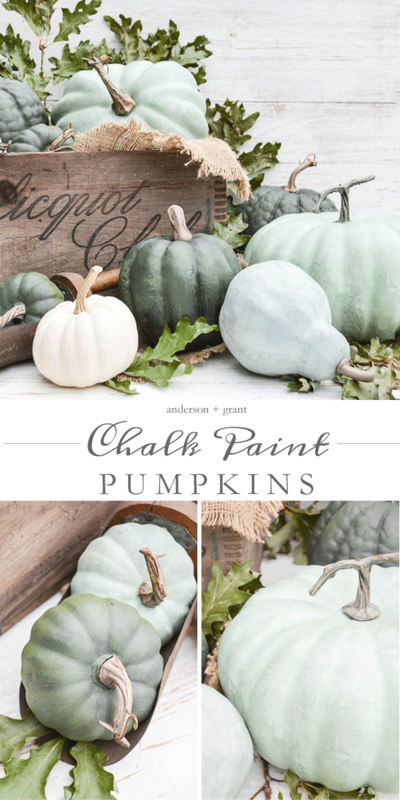 You're not trying to paint the pumpkin now, just highlight and accent it with a different color. Really rub the brush in and all around to smooth it all out. 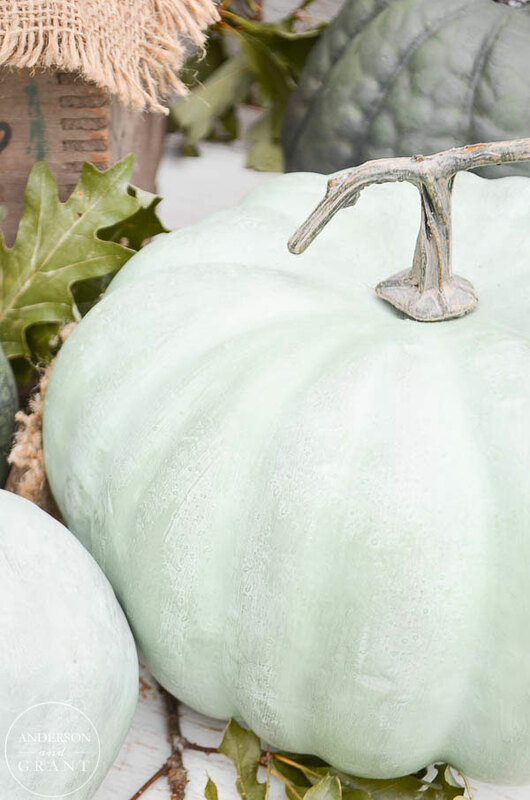 If you should happen to get too much paint in an area, add a bit of the base color onto the pumpkin to even out the finish. 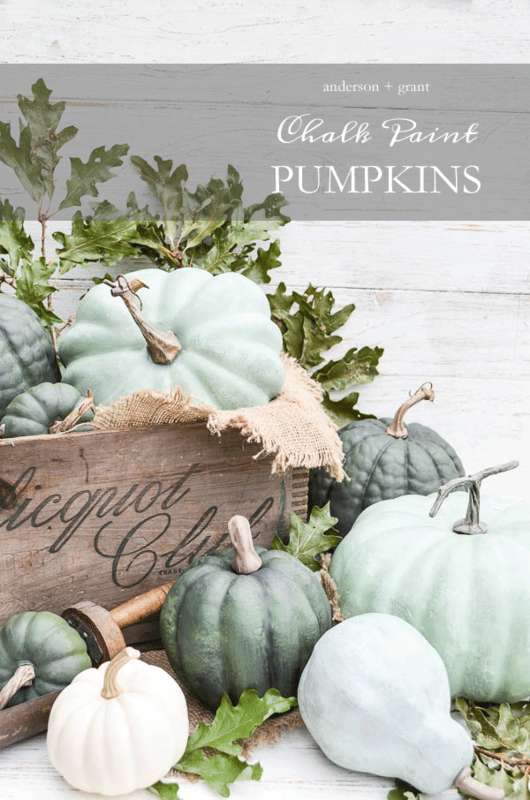 I actually had a hubbard squash sitting in front of me on the counter while creating these as a little inspiration for the color! It helps to see the real thing when trying to duplicate something from nature. The dry brush technique really brings out the imperfections in the plastic pumpkin giving it the look of the real thing. 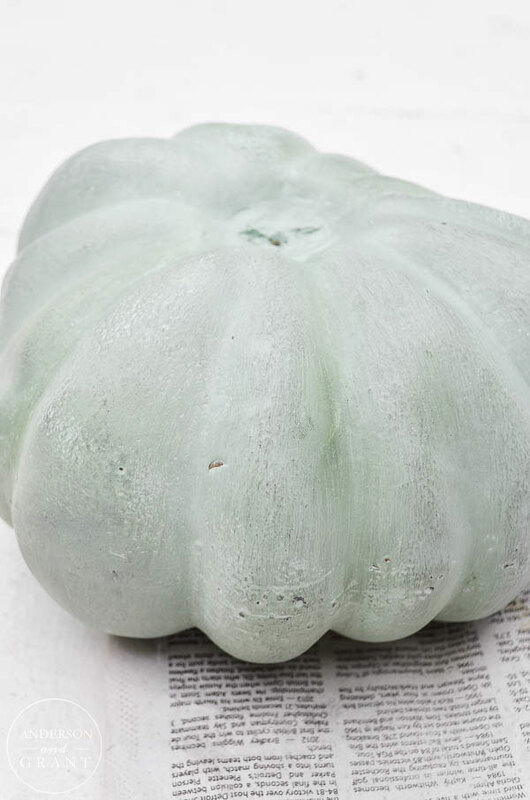 It also gives a lot of variations to the color which is what a natural pumpkin or squash would have. No two pumpkins are ever going to look alike or turn out exactly the same. Each one is unique. 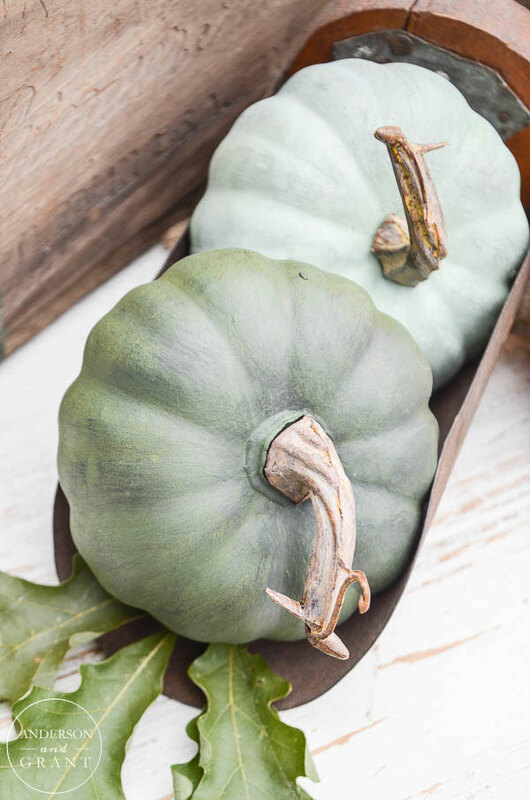 You might also enjoy seeing my post from last year about making some realistic DIY stems to add to your painted pumpkins using sisal twine, glue, and cinnamon! 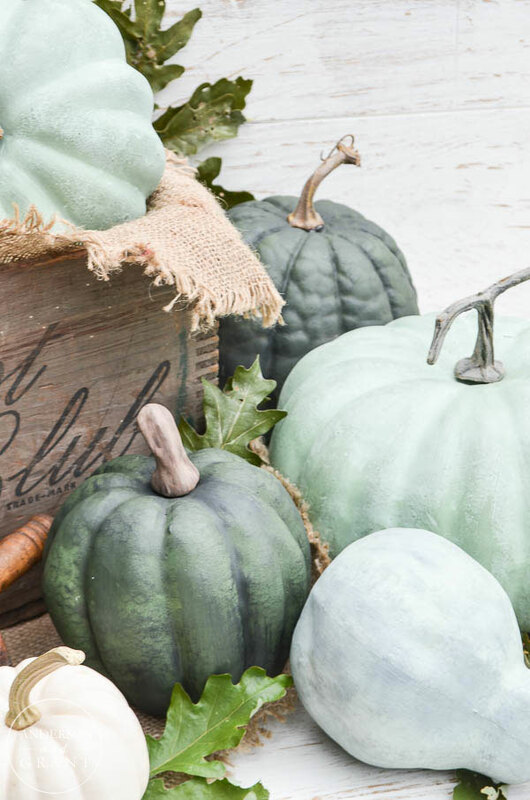 I'm showing my pumpkins here around a vintage wood crate (find one here), but you can tuck one in just about anywhere for a display. 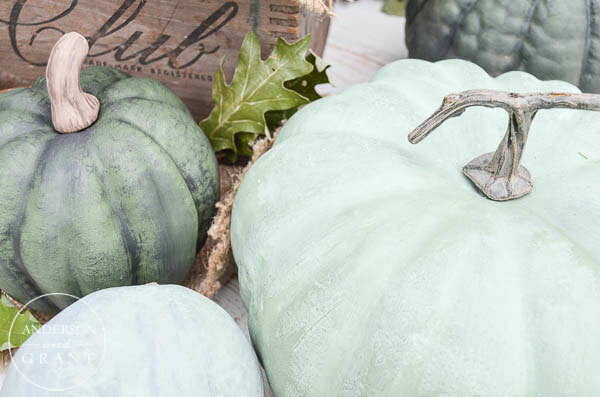 Add some dried leaves or a few real pumpkins (like my white one) to put the finishing touch on your creations! 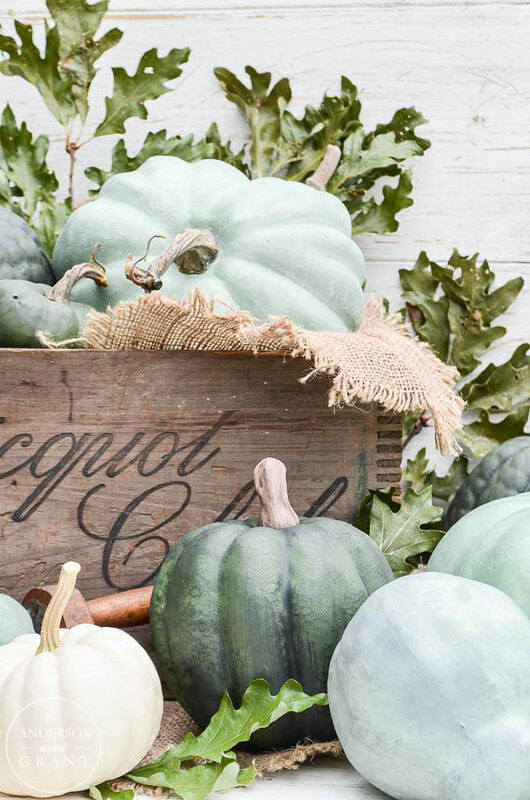 Does our Pumpkin Palooza sounds like something that you'd like to join in on? 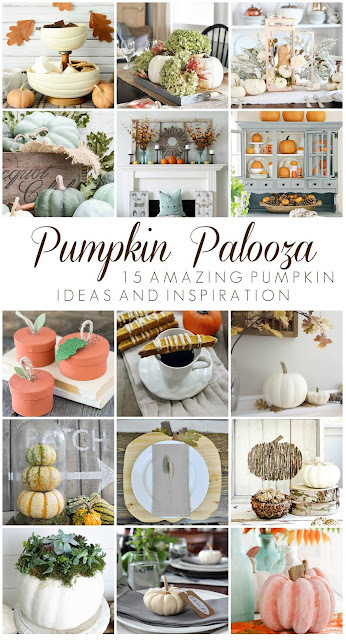 Follow me on Instagram and tag your photos with #OctoberPumpkinPalooza for the chance to be featured on our IG pages! Thank you so much for visiting today. 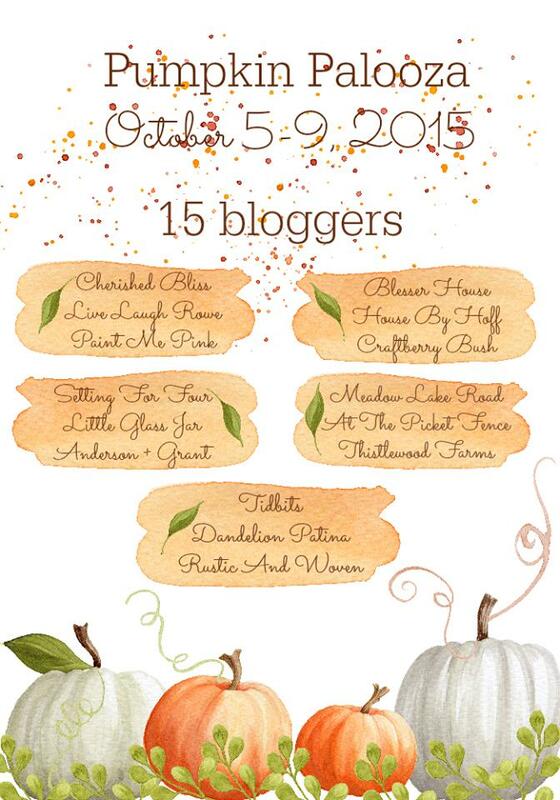 Please have a look around the other creative ideas from my fellow bloggers!